Conan Doyle's original Sherlock Holmes was a brilliant white man. “Elementary” takes that blueprint and turns it inside out. The best thing about "Elementary" is that it isn't about the genius of Sherlock Holmes. The CBS detective drama, now entering its sixth season, reimagines the classic mystery protagonist as a modern-day, New York dwelling detective, played with neurotically virile stiffness by Jonny Lee Miller. But in contrast to virtually every other Holmes adaptation, this version of Sherlock isn't a heroic mastermind whose intellect elevates him above the lesser mortals around him. Rather, the show is often about how Watson — that perennial intellectual straight “man” — is Holmes' equal. Instead of a story about individual idiosyncratic genius, “Elementary” is a narrative about teamwork between Holmes and his (in this version) female partner Joan Watson, played by Lucy Liu. In contrast to virtually every other Holmes adaptation, this version of Sherlock isn't a heroic mastermind whose intellect elevates him above the lesser mortals around him. Beginning with Sir Arthur Conan Doyle, the dynamic between Sherlock and Watson has been mostly one-sided. In the famous first meeting between Holmes and sidekick Dr. John Watson, in Doyle's novel “A Study in Scarlet,” the detective instantly deduces that Watson has been fighting in Afghanistan, to the other man's wonder. In the BBC's acclaimed series “Sherlock,” set in modern London, Holmes (Benedict Cumberbatch) goes even further, concluding in an instant that Watson (Martin Freeman) has post-traumatic stress disorder and that his limp is psychosomatic. Holmes knows Watson better than Watson knows himself. In “Sherlock,” in fact, Holmes' brain is depicted with numbers scrolling across the screen and visual insets, giving the viewer a sense of frantic multi-level cognition. Normal mortals can do little more than goggle and gasp in the presence of such mastery. Watson's function in these stories is to be an admiring sounding board. Holmes doesn't need Watson's help in solving cases, but he relies on him for muscle (in the original stories) or for heart (in later variations.) Holmes' intelligence makes him a snotty jerk who most people find insufferable in “Sherlock,” as well as in the 2009 Guy Ritchie-directed “Sherlock Holmes” film trilogy. "I am a ridiculous man," Cumberbatch declares in the BBC “Sherlock,” adding that he is redeemed only by Watson's love. In “Sherlock Holmes,“ Watson (Jude Law) is about to get married and Sherlock (Robert Downey, Jr.) tries to interfere because he wants Watson's ministrations for himself. Watson in these narratives is a kind of wife, providing the emotional labor necessary to keep the genius on task. Thus the stream of uncomfortable, borderline homophobic jokes about Holmes and Watson in Ritchie's adaptation. “Elementary” takes the textual feminization of Watson a step further by casting an actual woman, Liu, to play Joan Watson. Initially, the series literalizes the caretaker role. Holmes is a recovering addict, and Joan is hired by his wealthy father as a sober companion to keep him from relapsing. The dynamic at first seems similar to that of other modern adaptations. Holmes is a brilliant, irritating, abrasive genius; Watson is the emotionally stable, pedestrian partner who keeps him on track. Over the course of the series, it has become clear that the relationship between Joan and Sherlock is much more complicated, and much more egalitarian. But over the course of the series, it has become clear that the relationship between Joan and Sherlock is much more complicated — and much more egalitarian. Joan is fascinated by the work of detection, and is, moreover, very good at it. She eventually decides to stop being Sherlock's sober companion and instead becomes his apprentice. In many cases, she is the one who solves the crime; it's she who ultimately outwits the nefarious Moriarty (played with relish by Natalie Dormer). In the fifth season finale, Holmes is mostly incapacitated and Joan is the one to bring down a criminal genius drug lord. Joan gets to do detecting; Sherlock for his part, often provides the emotional support. Liu is a master of eye-rolling exasperation, but the show delights in quietly showing that Watson is as stubborn and as difficult to manage as Holmes himself. In yet another role reversal, it’s Joan whose insatiable curiosity often puts her at risk. And it's Sherlock who, on more than one occasion, urges caution, or provides reassurance. The heart of the show is the way the characters riff off each other, throwing around ideas and running down clues. Joan is not Sherlock's only partner, though. Holmes eventually takes another apprentice, Kitty Winter (Ophelia Lovibond), who also catches clues Holmes misses, and occasionally outthinks him. In other versions of the Holmes narrative, the police officers Holmes works with are bumbling oafs; Inspector Lestrade (Eddie Marsan) in the 2009 film, for example, is practically a Three Stooges character. But Detective Marcus Bell (Jon Michael Hill) on “Elementary” is a respected colleague, quite capable of identifying clues on his own, and skillful in following up investigative leads. Holmes in “Elementary” has an encyclopedic knowledge of cigarette ash and bullet casings, and he'd be the first to tell you he's brilliant. But — as he'd also be glad to tell you — the real value of his work is that he does it with Watson, and with others. The heart of the show is the way the characters riff off each other, throwing around ideas and running down clues. 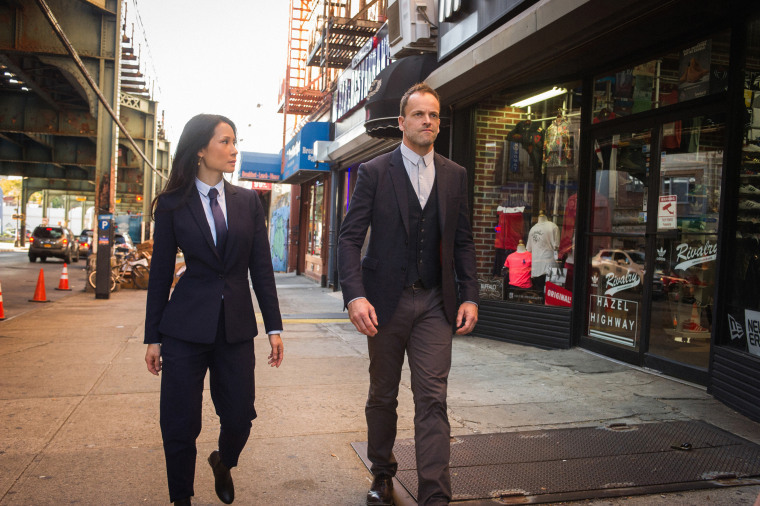 And in a welcome departure from many other contemporary cop dramas, Lucy Liu and Jonny Lee Miller have a remarkable, and carefully cultivated, lack of romantic tension; the show makes it absolutely clear that Joan and Sherlock will never be lovers. But despite that (or because of it), each episode feels like a kind of romance, as Holmes and Watson investigate and discover each other in the process of investigating the crime. Conan Doyle's original Sherlock Holmes tales centered around a brilliant, singular talent — a person who was not coincidentally white, and not coincidentally male. “Elementary” takes that blueprint and turns it inside out. Rather than one genius, the show is about how different people can work to find the truth together. The real genius of “Elementary” is that, in its quiet, comforting, formulaic way, it refuses to believe in genius. It believes in other people instead.